PanARMENIAN.Net - A drug which has been used to treat liver disease for decades could help restore cells damaged by Alzheimer's, a study claims, according to Daily Pioneer. Researchers from the University of Sheffield in the UK discovered the drug ursodeoxycholic acid (UDCA) improves mitochondrial dysfunction -- which is known to be a causative factor for both sporadic and familial Alzheimer's disease. Mitochondria play a pivotal role in both neuronal cell survival and death as they regulate energy metabolism and cell death pathways acting as a cell's battery, according to the research published in the Journal of Molecular Biology. Mitochondrial abnormalities have been identified in many cell types in Alzheimer's disease, with deficits occurring before the development of the classical pathological aggregations, researchers said. The energy changes have been found in many different cells from people with Alzheimer's, they said. "For the first time in actual Alzheimer's patient tissue this study has shown that the drug UDCA acid can boost the performance of the cells' batteries, the mitochondria," said Heather Mortiboys, a senior research Fellow at the University of Sheffield. "We also found that the drug, which is already in clinical use for liver disease, acts by changing the shape of the batteries which could tell us more about how other drugs can be beneficial in Alzheimer's," Mortiboys said. "Most importantly we found the drug to be active in cells from people with the most common type of the devastating disease -- sporadic Alzheimer's -- which could mean it has potential for thousands of patients," said Mortiboys. As the drug is already in clinical use for liver disease; this speeds up the potential time it could take to get this drug to the clinic for patients, researchers said. The research also found the drug changed the shape of mitochondria by redistributing Dynamin-related protein 1 (Drp1) to the mitochondria in people with Alzheimer's skin cells. Drp1 is a regulator of mitochondrial shape and locates at the mitochondria to initiate fission events. 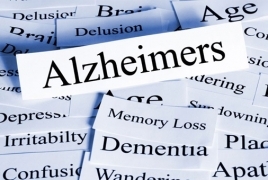 It is thought this could have neuroprotective effects in Alzheimer's disease, researchers said. The study suggests this pathway could be manipulated by drugs which are then neuroprotective in patients themselves, they said.